Momodora: Reverie Under the Moonlight, from Bombservice, will be arriving this week on PS4 and Xbox One! 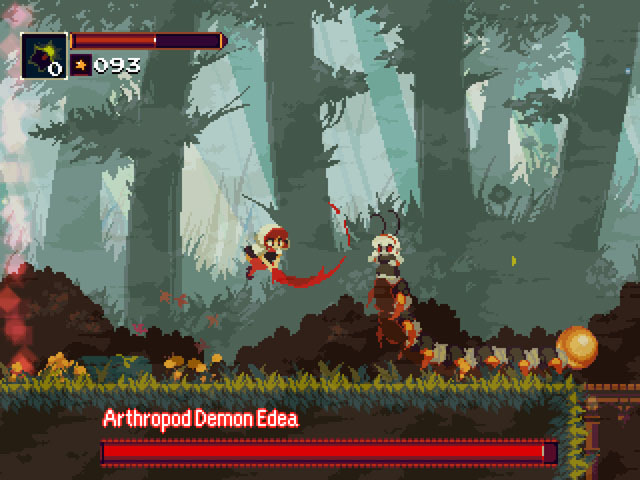 This is actually the fourth game in the Momodora series, but is a prequel to the original freeware games released on PC... and they're all great, so you should go and play them. The latest adventure features Kaho, a priestess whose village has come under attack by evil spirits, but when she sets out to seek an audience with the queen in the Kingdom of Karst, she finds that it too has fallen under the curse, as the world of the living is being merged with the world of the dead, and spirits wander the streets. As in the previous games in the series, the player interacts with NPC's who are on quests of their own, occasionally crossing paths with Kaho... and sometimes getting in her way. This is an open-world action adventure with light metroidvania elements, and offers a longer quest than any of the previous games in the series, with numerous enemies and bosses to face along the way, and an array of active and passive buffs to aid Kaho in her quest. You can check our full coverage of the game here, and get caught up on the first three games in the series here.